If It's Too Loud...: The Needy Sons - "Too Thin"/"Red Line"
The side project/moderate supergroup featuring Bill Janovitz of Buffalo Tom, Mike Gent of The Gentlemen, and Ed Valauskas of The Gravel Pit already have a new single out. This time around the A-side, "Too Thin," is sung and written by Mike Gent. It's a chilled out, mid-tempo track that's a great foil to Bill Janovitz's contribution, "Red Line." "Red Line" is a much faster, more rockin' song featuring a killer guitar solo. Both songs fit in perfectly with The Needy Sons' straightforward bar band feel. It's great seeing two established musicians and songwriters coming together to just have some fun with music on these songs. Hopefully next month will bring us some more. 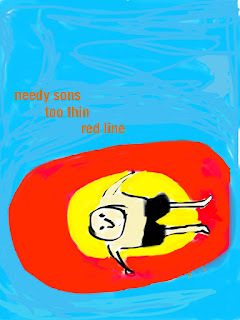 You can check out The Needy Sons on Bill Janovitz's Bandcamp. You can also check out his website for all your other Bill Janovitz related needs.